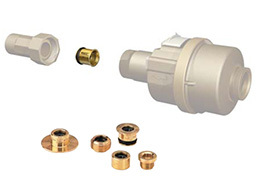 Maric Insert type valves are the relatively small flow control valves intended for press or slip fitting inside other equipment e.g. specially prepared housings, manifolds, or water meters and meter tails. Plain inserts. These are the smallest possible housing, and are generally press fitted, and are not usually removable. Five body diameters are available which cover the full range of flow rates, up to 233 Litres per minute, and suit each of the five series (nominal size) of control rubbers manufactured by Maric Flow Control. Special inserts. These are specially made to suit customer’s specific dimensional requirements for their OEM equipment. They are generally fitted with an o’ring, for the purpose of sealing and holding the insert in place. These are relatively easy to remove.